The Hon. Luke Donnellan, Minister for Roads and Safety, and Ports, together with his Senior Advisor Murray Newton, recently visited our premises at Sunshine West. 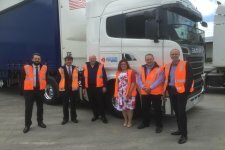 With 2016 being marked as a year for change and new venture for Snapes Project Logistics; a visit by the Minister certainly sets the scene at the starting line. It was humbling to have him spend time to meet our growing team and to discuss what the future holds for our company. Recently we discovered the latest figures by the Australian Bureau of Statistics reporting that; of micro, small and medium organisations – 62% have experienced barriers to innovation. This must be a tremendous disadvantage and loss to those businesses. Without these tools, companies are less likely to operate as efficiently, competitively, and enduringly as those that do. We are fortunate to have a CEO with determination and vision who, together with our Technology Partners, enabled Snapes Project Logistics to innovate by creating and implementing customised operating programs and reporting software. The State Government has always been supportive of Victorian companies that innovate, expand, create high-skilled jobs and help boost the economy. Trade missions, grants, assistance programs and industry awards have always been on-going Government vehicles to help further develop small businesses. Their recognition of our efforts in the application of technology to pursue operational efficiency and improving the customer experience has been very encouraging. With the provision of these tools combined with on-going training and upskilling of our staff, we hope to benefit our customers with improvements in project management, project efficiency, reporting, and responsiveness. We appreciate our customers’ on-going support, some of whom have been with us for over 20 years, and we look forward to continue helping them provide satisfaction to their end customers.